A few months ago, I wrote a second post on signs and symbols of the church and what they mean: everything from crosses to Christograms, to the Alpha and Omega and the Fleur de Lis. Read it here, in case you missed it. Today, I'm following up on these posts with a closer look at the logos, seals, and emblems that represent these denominations - the colors, symbols, and history embedded within each one, and how they connect to the denomination's core beliefs. A quick note: The logos, seals, and emblems included in this post are registered trademarks and protected under common, state, and federal law. They are used with permission. Please do not copy, duplicate, reproduce, save, or alter the images in any way. They are intended strictly for educational purposes. 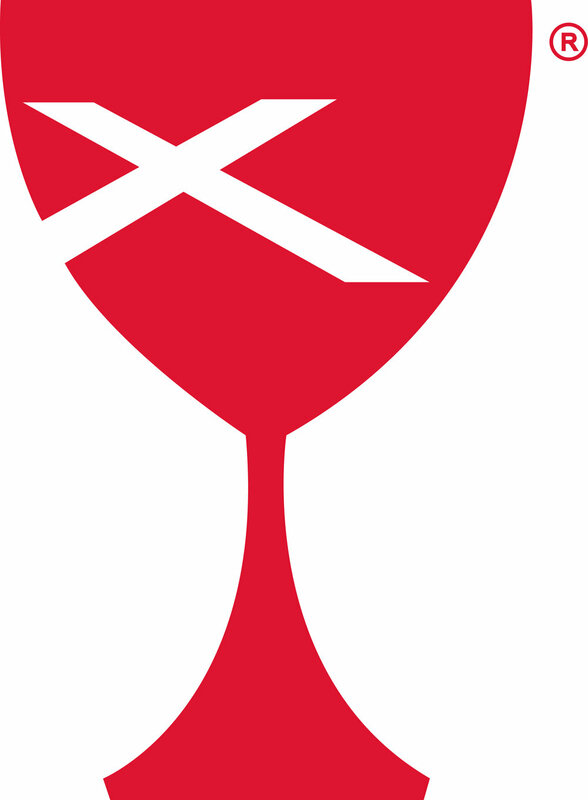 The Episcopal shield incorporates two different crosses: the large red cross is St. George’s Cross (of the Church of England) and the nine smaller crosses in the upper left-hand corner form a St. Andrew’s Cross (of the Church of Scotland) - nine represents the number of original American dioceses that founded the Episcopal Church. The colors red, white, and blue are used to show America as a representative of Anglican communion. Spiritually, the color red represents blood shed by Jesus and martyrs, white represents purity, and blue represents the color of Mary. For more information, see this article. 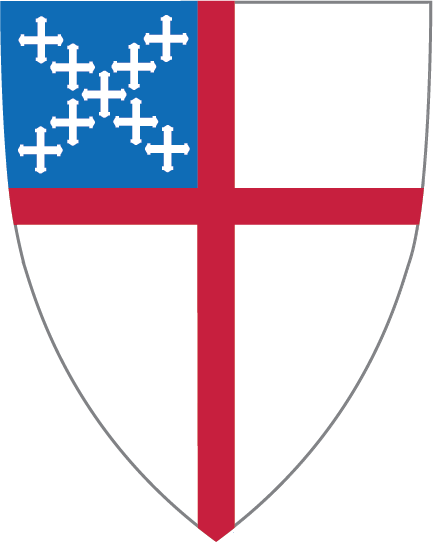 The Episcopal shield is a registered trademark of the Episcopal Church. Used with permission. Sketched by Martin Luther in the 1520s, the Luther Seal incorporates the cross, a heart, a rose, and the shape of a circle. The black cross is said to to represent the Jesus’ sacrifice, the heart is meant to represent our belief and how our faith sustains us. The white rose represents angels, peace, and joy, and the blue background is meant to signify heaven and future joy. The gold ring is a symbol of eternal life. For more information, see this article. The Luther Seal is in the public domain. The LCMS logo incorporates a three-part cross, representing the Trinity. The upper arms of the cross stretch up to God in prayer and the lower arms brings God’s love to the world. The 12 points on the cross represent the 12 tribes of Israel and the 12 disciples. The cross is drawn in a way that implies motion, portraying a sense of urgency to tell the world about God’s love. For more information, see this resource. The tripartite logo-cross is the exclusive property of The Lutheran Church—Missouri Synod and may not be used without the Synod's express consent. Used with permission. The ELCA brandmark incorporates the symbols of the cross and the world, representing their mission statement: “marked by the cross of Christ forever, we are claimed, gathered and sent for the sake of the world.” For more information, see this resource. The ELCA name, emblem, and tagline are registered trademarks and service marks of the Evangelical Lutheran Church of America (ELCA). Used with permission. The CRC emblem features the sign of the cross, representing Jesus’ sacrifice, and the shape of a triangle, representing the Trinity. For more information, see this article. The CRC emblem is a registered trademark of the Christian Reformed Church in North America. Used with permission. The RCA logo includes a cross, representing Jesus, and a person, representing the body of Christ. The intersection of these two components portrays the covenant Jesus made before his ascension. The person’s open arms and the color green portray growth and outreach. For more information, see this resource. The RCA logo is a registered trademark of the Reformed Church in America. Used with permission. The United Church of Christ (UCC) logo was redesigned in 2017. The new logo, depicting water and the world, represents the elements of Creation. For more information, see this article. The open book connects to the Reformed tradition and the emphasis on Scripture. The descending dove symbolizes the Spirit’s role in inspiring and interpreting Scripture, Jesus’ baptism, and peace. The pulpit conveys the value of preaching. The flames represent the burning bush and Pentecost. The triangle they form represents the Trinity and Presbyterian governance. The design was inspired by the Celtic cross, which connects to the denomination’s history. For more information, see this article. The PCA logo also features a Celtic-cross influence, connecting to the denomination’s roots. The cross and open book represent the denomination’s emphasis on Scripture and teaching. For more information, see this article. The PCA logo is a registered trademark of the Presbyterian Church in America. Used with permission. Adopted in 1968 with the merging of The Methodist Church and the Evangelical United Brethren Church, the Cross and Flame represents the Trinity: God through Jesus (the cross) and Spirit (the flame). The two tongues of fire represent the two denominations that merged into one. The mark also references Pentecost (Acts 2:3) and John Wesley’s conversion experience at Aldersgate, where he described his “heart strangely warmed.” For more information, see this resource. Adopted in the late 1980s, the Free Methodist logo incorporates the sign of the cross and a flame that stretches across the world. This symbolizes Pentecost and the gift of the Holy Spirit for the world. For more information, see this article. The Free Methodist logo is a registered trademark of the Free Methodist Church. Used with permission. The Church of the Nazarene logo, adopted in 2013, includes the symbols of a dove, flame, book, and cross. The cross represents the denomination's mission to make Christ-like disciples. The dove and flame represent the denomination’s vision of the Spirit working in and through us. The open book represents the denomination’s values: Christian, holiness, and mission-oriented. For more information, see this article. The Church of the Nazarene logo is a registered trademark of the Church of the Nazarene. Used with permission. The American Baptist logo includes a cross, representing Jesus’ death and resurrection, overlapping with the world, representing evangelism. The water symbolizes the believer’s baptism. For more information, see this article. The Southern Baptist logo includes the world, symbolizing evangelism and the denomination's belief that salvation is for all people. The symbol of the book portrays the denomination’s emphasis on the Word of God. The star-shaped cross represents Jesus’ death and resurrection and the Star of Bethlehem. The three components intersect to represent Jesus’ command: “Take up thy cross and follow me.” For more information, see this resource. The Chalice incorporates the signs of the cup and the cross. The cup represents the central place of communion in worship, and the St. Andrew’s Cross conveys the denomination's emphasis on evangelism. For more information, see this article. The Chalice is a registered trademark of the Christian Church (Disciples of Christ). Used with permission. Special thanks to all the denominations who granted me permission to include their logos, seals, and emblems in this post.